Harold Alexander was born in Caledon, County Tyrone on 16 December 1891. He was educated at Harrow and Sandhurst and served with the Irish Guards in the First World War in France, and later in India. He was awarded the Military Cross, the Legion of Honour and the Russian Order of St Anne. 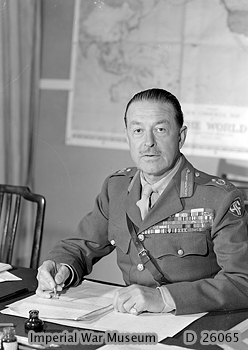 During the Second World War he served in Burma, the Middle East, North Africa and Italy, eventually becoming Allied commander in the Mediterranean with the rank of field-marshal. After the was he was appointed first Governor-General of Canada, and from 1952 to 1954, served as Minister of Defence in the government of Winston Churchill. He received the Order of Merit in 1959 and was raised to the peerage as the Earl Alexander of Tunis and Errigal. He died on 16 June 1969.